September 1, 2016 By Allyson Leave a Comment This post may contain affiliate links. Read my disclosure policy. 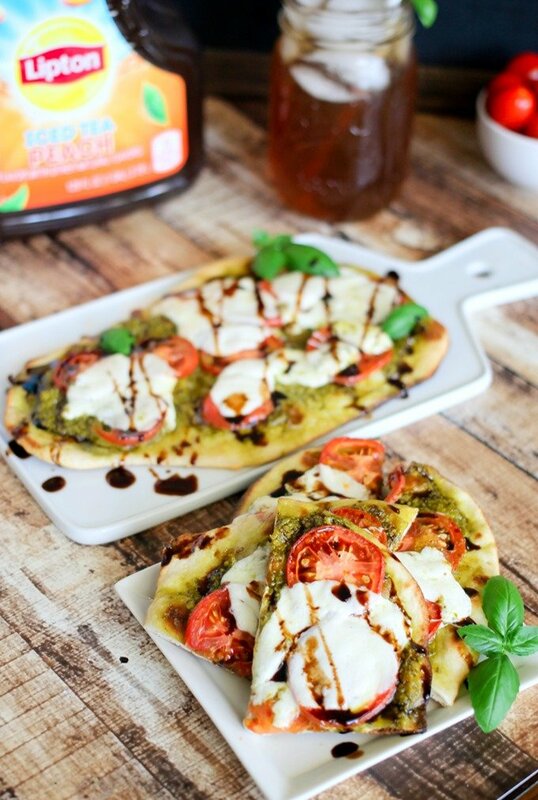 Grilled Caprese Flatbreads – the perfect combo of basil pesto, tomatoes, and fresh mozzarella all topped with a delicious balsamic glaze! Since it’s summer, I have been trying to incorporate more grilling into my typical cooking routine. It’s so lovely being outside; the kids are playing in our yard, my husband is relaxing or maybe doing some yard work, and I am cooking up a delicious family meal. It’s almost idyllic. When I think about summer, I always think about fresh ingredients and fresh food, and one of my favorite things is anything with caprese. 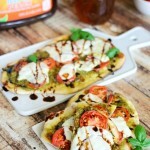 I decided to put a twist on the classic caprese salad, and make a delicious Grilled Caprese Flatbread. Growing up, I used to pick fresh tomatoes off my Dad’s tomato plants, and fresh basil from the garden. 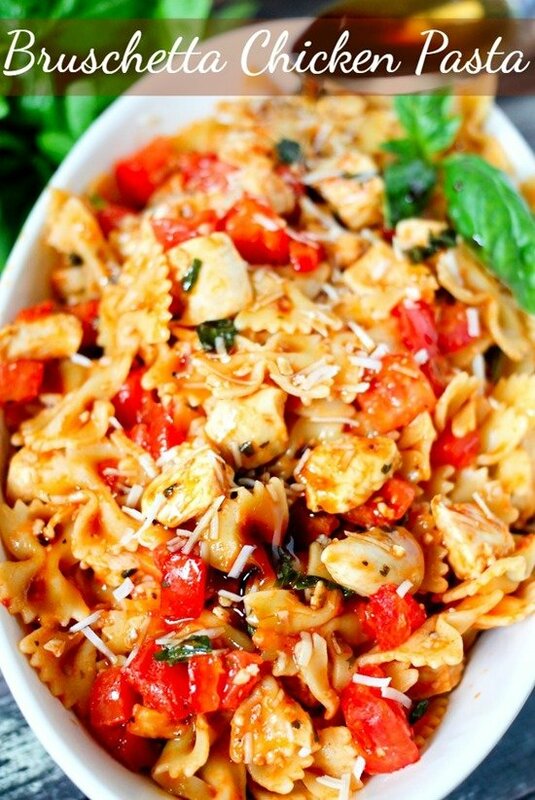 He would throw them together in a bowl with fresh mozzarella cubes and then drizzle balsamic vinegar on the top. I was in heaven, gobbling it up and begging for more. Thinking back to these found family memories, I try to come up with recipes that will hold the same memory for my kids. 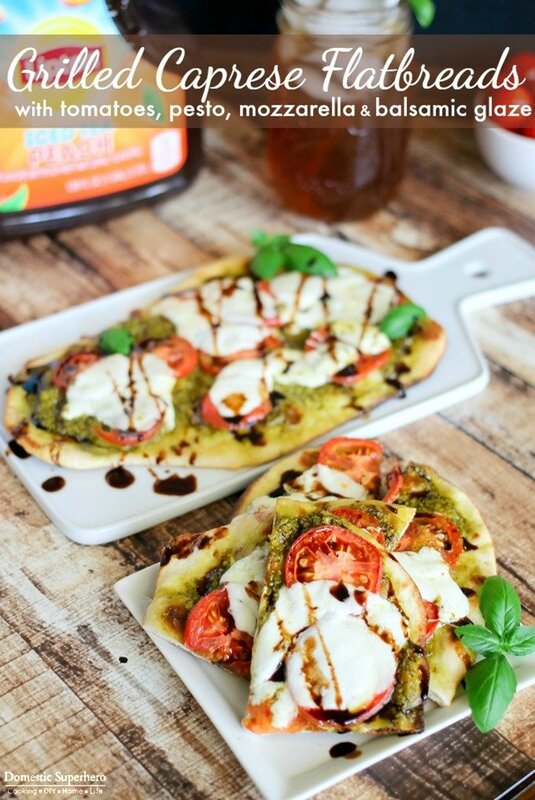 They absolutely love pizza, so I figured reimagining the salad into a delicious flatbread pizza would be totally delicious for them. Of course I decided to pair it with some Lipton Peach Flavor Iced Tea for myself and my husband, because it’s so refreshing and perfect for summer recipes. I actually made homemade naan for this recipe, but you are welcome to buy them pre-made as well. 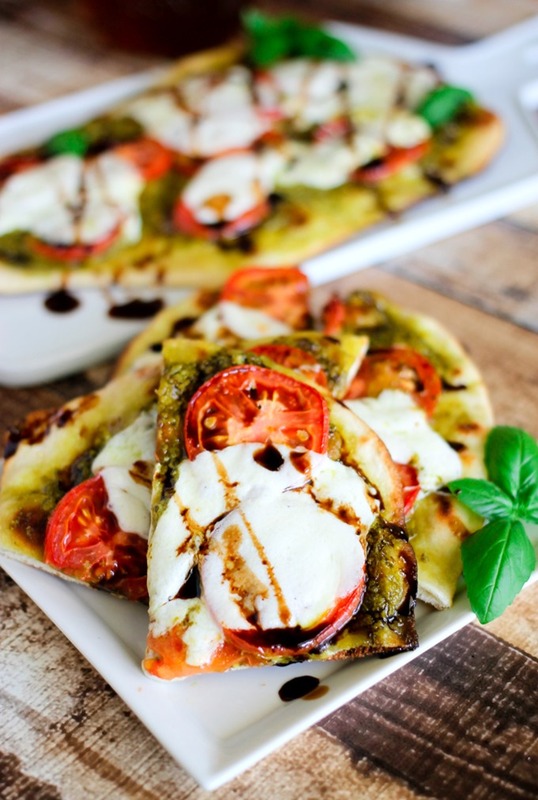 It’s a very simple recipe – pesto, tomatoes, fresh mozzarella, basil, and a delicious sweet tangy balsamic glaze. You load everything up on the flatbread, and then toss it on the grill for just a few minutes. 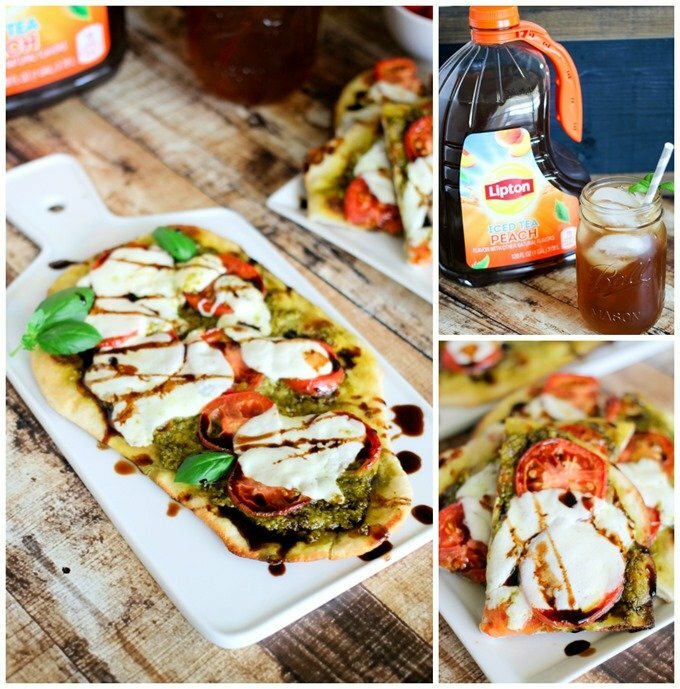 It really makes the meal to add Lipton Peach Flavor Iced Tea along with them Grilled Caprese Flatbreads. When my family and I are around the table enjoying this delicious meal, I always think about how blessed we are to have each other and to share these moments together. Re-imagining my favorite childhood recipe to serve alongside Lipton Iced Tea was a huge hit and I can’t wait to create something else to go along with one of my favorite beverages. For more recipe ideas to accompany Lipton Iced Tea, check out the Bright Bites Landing Page. 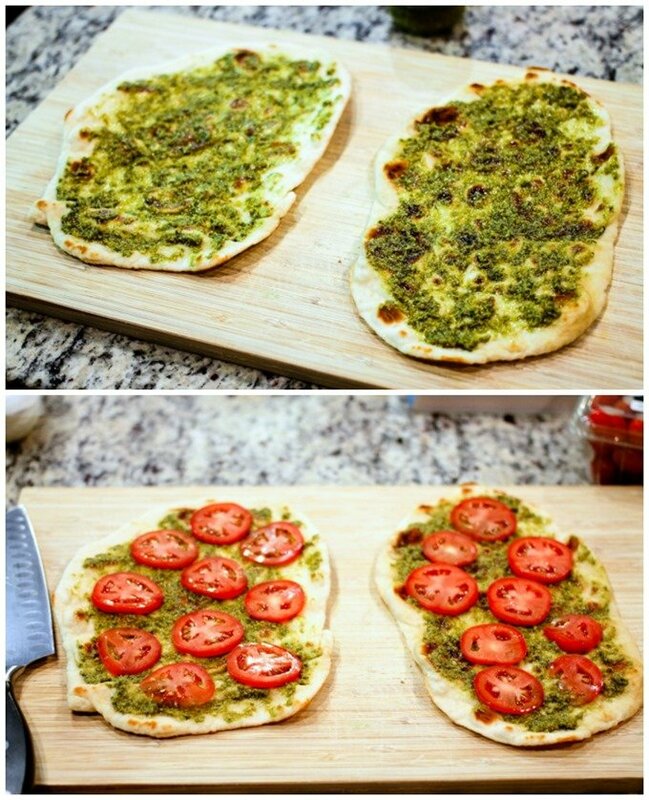 Arrange 2 flatbreads side by side and add pesto (divide evenly between 2 breads). Lay on slices of tomatoes, then top with sliced mozzarella. Heat grill over medium heat. Lay flatbreads directly onto the grill and close grill. Check after 2 minutes, and watch carefully as they might burn quickly if your heat is too high. Remove from grill when cheese is melted and they are toasted on the bottom (does NOT take a long time, just a few minutes), set aside. Prepare your glaze: add balsamic vinegar and sugar to a small sauce pot. Whisk to combine and bring to a boil. Simmer, stirring occasionally for about 10 minutes. Let cool for 3-5 minutes and sauce will thicken. Drizzle balsamic glaze over the flatreads, cut into fourths, and serve immediately.